It has some of the hallmarks of a Conan Doyle murder mystery, complete with period costume, a shooting, a body, a fairytale Victorian Highland setting, suspects, big city and small town locations, journeys in between, and – for good measure and Hollywood appeal – a strong American angle. In fact the central character is a ‘Yank’ – Accipiter gentilis atricapillus to be precise – the fabled Northern Goshawk. 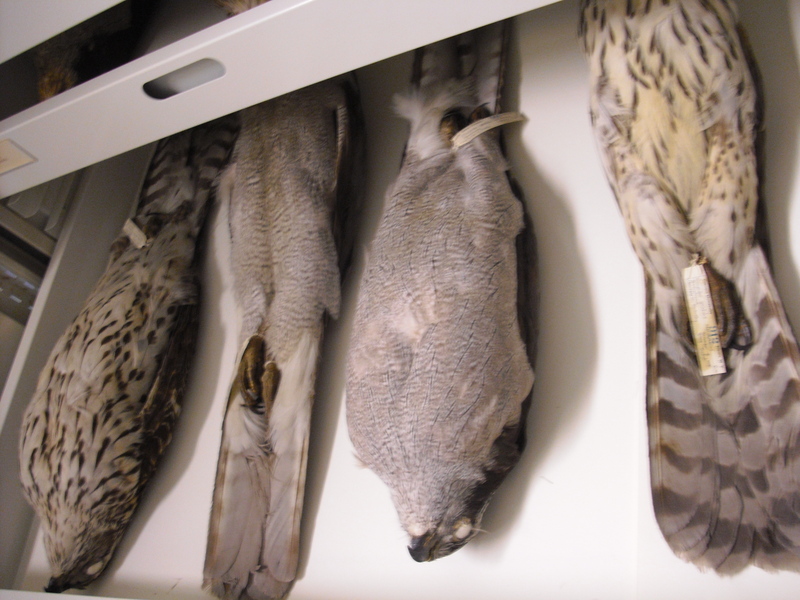 Specimens of US race goshawks photographed at Cornell Lab, New York state. It’s spring 1869 and there is unrest in the British Empire – Canada, this time. The finishing touches are being put to the Cutty Sark in a Glasgow shipyard. She will be one of the last of the tea clippers built, as the age of sail gives way to steam power. The journal Nature is also launched, and the People’s Friend. A gamekeeper called Stewart is patrolling the slopes of Schiehallion – the ‘hill of the fairies’, some say – in Perthshire. Spying a bird of prey, in the tradition of the day he shoots it dead. By and by, he gets into conversation with a road surveyor called Menzies, who relieves the keeper of the bird, which has been crudely gutted. Menzies takes it to the town of Brechin, on the east coast, and a shop owner there by the name of Lyster. Lyster can turn his hand to taxidermy, and sells many things, chief among which are fishing lures, for which Red Kite Milvus milvus feathers are particularly suited. But the skin he is presented with is no kite, or gled, as they were then known. In any event he has better things to work with, and puts it aside. Some time later a man called Gray drops in. He’s a keen ornithologist in his spare time and an inspector of banks by day. It’s not in great nick by this time but he recognises the bird skin as that of a Goshawk. He takes ownership of the specimen, and arranges for it to be sent on to Glasgow. There, he has another taxidermist clean, stuff and mount it. Goshawks were by this time rare, even in Scotland. It would be extinct as a breeder in Britain in little more than a decade. Having collected his order from the stuffer, it is only now that Gray realises there is something particularly unusual about this Goshawk. It is of the North American race atricapillus. At face value, this is the first record of its kind for Britain. The record is generally accepted. Gray later becomes a renowned and respected ornithologist and author of books on the subject. Fast-forward a century, and cutting a long story short, this American Gos is dropped from the Scottish list. No one today seems very sure why. By this time there were several records of American Goshawk from Ireland and one from England (Tresco, Scilly, 28th December 1935). In each case the birds were evidently shot, enabling close inspection. Forward again, this time to the present day, when the Perthshire record is reviewed once more, and officially rejected. Over at the National Museum of Scotland in Edinburgh, experts are once again peering at the mummified corpse. The identity of the bird is not in dispute, but there is apparently sufficient doubt over provenance, with the possibility that a different (American) Goshawk skin replaced that deposited by Gray in the Glasgow shop. The verdict suggests a general doubt over the American Goshawk’s ability to cross 5,000 km of ocean, a doubt in which it is easy to share. Even with a hurricane at its tail (there was such a weather event and a major fall of Goshawks in the USA in the late 1860s) and/or with the help of a boat, believing the gos can achieve this feat assumes a voyage of weeks or even months rather than days, and a diet of seabirds caught on the wing, over the waves, en route… unless Roger the Cabin boy had taken pity on the stowaway in the rigging, and was bringing it ship’s rations, or rats. Some ornithologists I’ve spoken to have shrugged at the idea of atricapillus being capable of crossing the Atlantic. ‘Northern Harrier Circus cyaneus hudsonius and American Kestrel Falco sparverius can do it,’ they’ll say. But this is to equate the talents of Mo Farah with those of Usain Bolt. The Gos, we know, is a bird that will spend most of an average day loafing, waiting for prey to come within ambush range: a sprinter, not a distance runner. They are three times as heavy as harriers. We know they can cross the North Sea, but show a peculiar reluctance to do so, if the low number of records for Shetland, the oil rigs and coming in off the east coast are anything to go by (one Scandinavian ring recovery, ever). But is it any more feasible that a Victorian trader would import such a specimen, and not label or market it for maximum value as an exotic? That it would be so casually or carelessly switched by a professional taxidermist for no apparent additional fee? 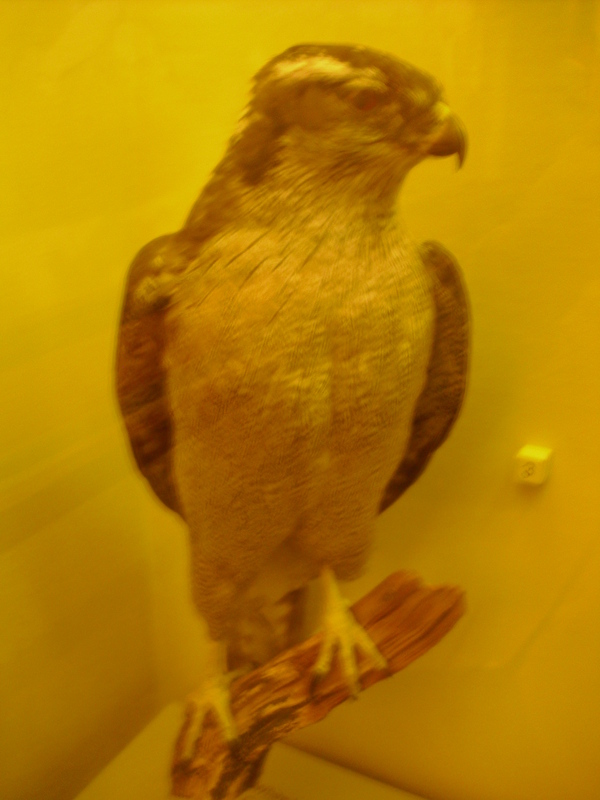 This goshawk of the US race atricapillus was photographed in the American Museum of Natural History in New York. In the end, we can only speculate. Despite some of the finest minds having been trained on it, the Perthshire Goshawk saga will probably remain one of the great unsolved mysteries of ornithology, and just one of the many riddles surrounding the enigmatic, spectral, much-studied yet poorly understood and dare I say widely overlooked Northern Goshawk. Footnote – the Irish goshawk records are also currently under review. The fact that two of the Irish records occurred within days of each other (both birds shot), and within weeks of the Perthshire gos, merely adds further intrigue to the overall tale. Conor’s book Looking for the Goshawk has recently been published by Bloomsbury.